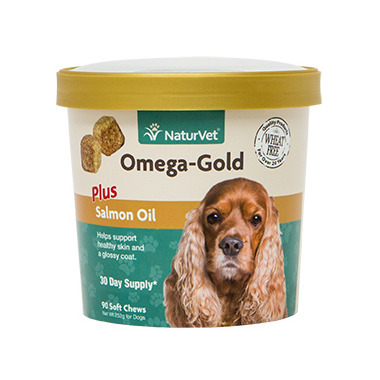 Naturvet Omega-Gold Plus Salmon Oil Soft Chews are rich in Omegas to help support healthy skin and a glossy coat. These soft chews also include Salmon Oil to help maintain normal moisture content in dry skin. Guaranteed Analysis (Per 3 Soft Chews): Linoleic Acid (Omega 6 Fatty Acid) (125 mg 1.39%). Linolenic Acid (Omega 3 Fatty Acid) (450 mg), DHA (Docosahexaenoic Acid) (47 mg), and EPA (Eicosapentaenoic Acid) (38 mg). Inactive Ingredients: Flaxseed, Potato Starch, Glycerine, Brewer֒s Dried Yeast, Lecithin, Salmon Oil, Maltodextrins, Deionized Water, Natural Flavoring, Tapioca Starch, Natural Mixed Tocopherols (a preservative), Sorbic Acid (a preservative), Citric Acid (a preservative), and Rosemary. Great product! Packed with vitamins. My pup loves the way it tastes, canâ€™t get enough of it. Using it for a puppy who does not like the oil on her food. She loves it and eats it like a treat. Her coat is very glossy. We have two dogs...a 17 year old and a 2 year old. We love all the Naturvet products. We started using this product to replace a more expensive one from the vet. Happy with it! Have just begun to use this product for our elder dog. Seems to be doing the job of a good coat. Only gave a 4 because we haven't been using for very long. She does love it. Our dog Casey loves these and her fuzzy Sheepdog coat is starting to look shinier! They're also a great alternative to salmon oil as her beard doesn't have a fishy smell anymore. Already ordered a second container! My dog's skin is no longer dry and her coat is nice and shiny. My dog loves these. Every morning she wakes me up and goes to the soft chews and looks at them and then me until I give them to her. Bought them many times already. Recommend it. Natural product. Great for skin and coat. My dog had a bit of dry, itchy skin in the winter. When he started taking these chews, all itchiness went away. We give them to him when the weather is dry; no need for every day feeding. And these chews taste really good, he loves them! Bought them several times already, will continue to buy. Recommend it.